A woman from Gloucestershire has been jailed for five months for making hoax phone calls to the family of murdered 13-year-old, Amanda Dowler. Lianne Newman, from Tewkesbury, had impersonated Amanda - known as Milly - in calls to the girl's father, her school and the police. Magistrates at Cheltenham were told she made the calls because it made her feel wanted. The 21-year-old was said to be an attention seeker who got a thrill from pretending to be the schoolgirl. 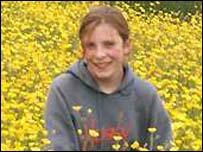 Milly Dowler, from Walton-on-Thames in Surrey, was found dead in woodland in Fleet, Hampshire, last September. Her funeral took place in March, on the anniversary of her disappearance. Despite a huge police inquiry costing more than £1m, her killer has not been found.